Prime Minister Hun Sen on Monday welcomed the end of talks over changes to the national election law and said the opposition CNRP has agreed to include in the law his proposal to strip National Assembly seats from any political party that boycotts parliament after an election. Opposition leader Sam Rainsy said that the draft law was completed Monday evening and does not, to his knowledge, include the rule proposed by Mr. Hun Sen, but added that further discussions about the proposal will be held. Speaking at the National Institute of Education in the morning, Mr. Hun Sen congratulated Interior Minister Sar Kheng and Mr. Rainsy on ending the long-running negotiations in a four-hour meeting on Saturday evening. A number of compromises were reached, including the CPP allowing two new parliamentary seats to be added and the CNRP allowing for reduced campaign periods, and Mr. Hun Sen said the settlement was commendable. “I would like to express congratulations today. On Saturday, the 28th of February 2015, the issues regarding the election law were agreed upon,” Mr. Hun Sen said, before adding that his own suggestion—meant to avoid post-election deadlocks—had also been agreed upon. “Those [elected lawmakers] who do not enter to take an oath to obtain their validity and those who do not take part in meetings [of the Assembly] and so on…[we] will see how their seats are lost,” Mr. Hun Sen said. 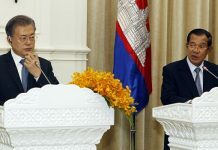 Mr. Hun Sen said last week he would veto the new election law if the rule were not included in the law. A statement released after the negotiations Saturday evening said the suggested provision would be negotiated further. Mr. Rainsy said Monday he stands by that statement, but that the draft law had been completed by officials from both parties at another four-hour meeting Monday evening. “The wording is completed now. The draft law is completed. We have the two draft laws,” Mr. Rainsy said, referring to the national election law and another law forming the new National Election Committee (NEC). The opposition leader said he did not believe the prime minister’s suggested provision was part of the completed draft law. “According to my colleagues who attended the discussion that finished half an hour ago, not to my knowledge. I may have forgotten, but I do not know about this provision in the draft law that has just been completed,” Mr. Rainsy said. 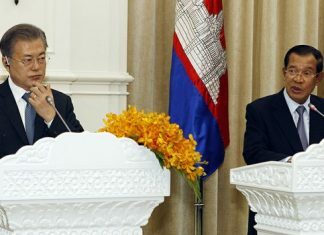 The opposition leader declined to comment further about Mr. Hun Sen’s proposal or comments Monday. 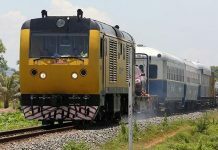 Both the CPP and CNRP agreed on Saturday to hold further talks to discuss the provision. Deputy Prime Minister Bin Chhin said after Monday’s drafting session that the first such meeting could be scheduled for next week. “This point…was also raised. The CNRP especially has to prepare to discuss the issue and put it to the workshop. And [this must happen] before this law is approved by the National Assembly,” Mr. Chhin said. Mr. Rainsy said in an interview on Sunday that Mr. Kheng indicated during Saturday’s talks that the prime minister’s proposal may not in fact have to be placed in the draft election law. “What I heard from Sar Kheng is that the CPP just made a request. There are no deadlines or conditions that it should be in the election law,” he said. Mr. Rainsy said the new election law could be introduced in a special meeting of the parliament as early as this month—despite the remaining talks around Mr. Hun Sen’s proposal. The draft election law will be presented to the National Assembly in tandem with the law to create the new bipartisan NEC, the keystone of election reforms negotiated by the two parties last year.